NEW DELHI, Feb 16 2017 (IPS) - Jaipal Hembrum runs three one-man home enterprises – a bicycle repair shop, a tiny food stall and a tailoring unit in Kautuka, a remote village in eastern India. Sewing recycled clothes into mattresses late into the evening, the 38-year-old father of three girls says two light bulbs fed by a solar power system have changed his life. Given the trajectory of development India is currently pursuing, energy access for its rural population could bring dramatic economic improvement. Yet 237 million people — a fifth of its 1.3 billion people, many of them in remote villages with few livelihood options — do not have any access to it. The Delhi-based research organisation Centre for Science and Environment (CSE) stipulates that if even half of households deemed electrified through the national power grid are not receiving the guaranteed six hours uninterrupted supply, the number of people who are electricity-poor in India totals 650 million. In this scenario, renewable energy-based mini-grids, particularly in remote villages, are considered the best option to manage local household and commercial energy demand efficiently by generating power at the source of consumption. This is being proven true by the Rockefeller Foundation’s Smart Power for Rural Development (SPRD) initiative in two of India’s poorest states, Bihar and Uttar Pradesh, where 16 and 36 percent of households respectively are electrified. 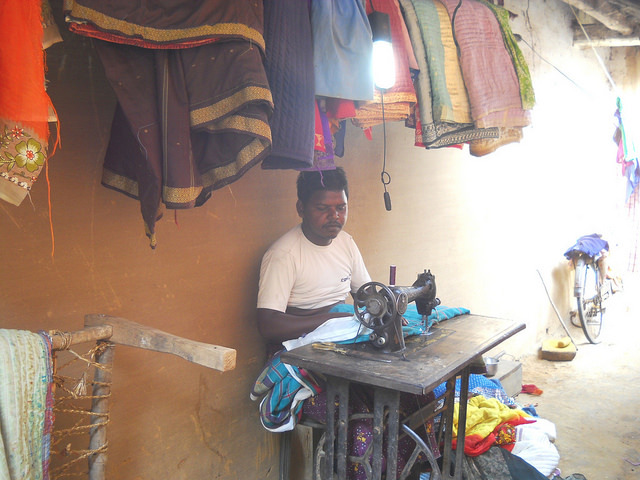 In India, 55 percent rural households have energy access, often of unreliable quality. The challenge India faces is how to meet its energy requirements while also meeting its emission reduction commitment to the global climate deal. Started in 2014, the SPRD project has helped set up close to 100 mini-grid plants, covering the states of Uttar Pradesh, Bihar and lately, in Jharkhand too. According to Rockefeller Foundation sources, these plants are serving a customer base of around 38,000 people. Over 6,500 households are benefitting, along with 3,800 shops and businesses, and over 120 institutions, telecom towers and micro-enterprises. Over 2014 – 2017, the Rockefeller Foundation aims to make a difference to 1,000 energy-poor villages in India, benefitting around a million rural people. For this effort, the Foundation has committed 75 million dollars, partnering and funding Smart Power India (SPI) a new entity designed to work closely with a wide range of stakeholders who help scale-up the market for off-grid energy. A recent evaluation of the mini-grids’ impact on communities they serve in Bihar and Uttar Pradesh already show a broad range of economic, social and environmental benefits. Entrepreneurship and new businesses have grown, with 70 percent existing micro-businesses reporting increased number of costumers after connecting to the mini-grids and 80 percent planned to expand. Nine in 10 household users said their children’s daily study time has increased by two hours since they got the lights. Women said they had increased mobility after dark and theft cases had fallen. Use of kerosene and diesel has fallen dramatically — to virtually zero, according to Khanna. Micro-businesses like cyber cafes, fuel stations, mobile and fan repair shops, banks, schools and hospitals are the fastest growing commercial customer section of mini-grids constructed under Smart Power India. In Shivpura village of Uttar Pradesh, where TARA Urja, a small energy service company (ESCO), started providing reliable electricity from a 30-KW solar plant, Sandeep Jaiswal set up a water purification processor in 2015. In just over a month he was rushing 1,200 litres of water on his new mini-truck to 40 customers. TARA, also a social business incubator, has financially supported Jaiswal with 530 dollars, in return for a one-year contract to source electricity from TARA. Smart Power India supports the development of rural micro-enterprises through loans, community engagement and partnerships with larger companies with rural value chains, for instance, city malls that source vegetables from rural farms. India confronts a demographic youth ‘bulge’ with 64 percent in the working age group in 2020, requiring 10 million new jobs every year in the coming decade. Using green mini-grids to create rural livelihoods can also reduce urban migration. Mini-grids are a decentralized system providing a renewable energy-based electricity generator with a capacity of 10 kilowatts or more, with a target consumer group it supplies through a stand-alone distribution network. The sustainability of private companies in the rural power supply sector depends on generating sufficient revenue long-term. To make it profitable for smaller-scale ESCOs to bring electricity to rural parts of the developing world, the Smart Power model ensures fast-growing sectors with significant energy needs such as telecom towers in rural areas, to provide steady revenue. In return, the ESCOs provide contractual guarantee of reliable power supply to the towers. “There is an opportunity to catalyze the telecommunication and off-grid energy sectors. Currently cell phone towers in rural areas are often powered by expensive diesel generators and companies are looking for cheaper alternatives, thereby creating the possibility for a strong anchor,” says Ashvin Dayal, Managing Director, Asia, of the Rockefeller Foundation. Telecom towers — by becoming the ‘anchor’ customers – help make ESCOs bankable. They then can expand supply into rural household lighting and local enterprises. Government figures say 2 billion litres of diesel is annually consumed by the 350,000 existing telecom towers in India, including those in remote rural regions. The challenge India faces is how to meet its energy requirements without compromising environmental sustainability, while meeting its emission reduction commitment to the global climate deal. Solar power cost per unit has fallen in India to 0.045 cents, which makes it increasingly feasible to shift to renewable powered mini-grids, saving substantial subsidies spent on fossil fuels. The government in 2016 decided to construct 10,000 mini-grids in the next five years of 500 megawatt (MW) capacity, but this is clearly not enough, say experts. India has a potential for 748,990 MW of solar power. Fourteen states, including Bihar and Uttar Pradesh, receive irradiance above the annual global average of 5 kilowatt-hours per square meter per day. Around the world, approximately 1.3 billion people lack access to reliable and affordable means of electricity without which, growing their incomes, improving food security and health, educating children, accessing key information services becomes a major challenge. Energy access is critical to achieving several UN Sustainable Development Goals by 2030.